The 1st annual OBB Wahoo Charity Cup was held out of Old Bahama Bay in West End, Bahamas on Nov 16-18th 2017. 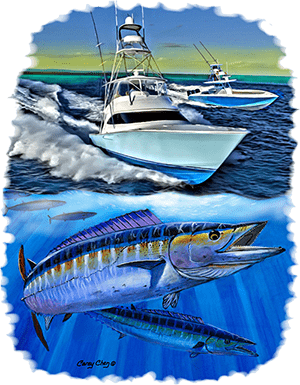 We had 23 boats register for the tournament and eighteen boats braved the angry gulfstream to compete in the 2 day wahoo tournament. This charity tournament raised over $105,000 for Leukemia and Lymphoma NI, one of the world’s leading research facilities for blood born cancers. 20% of all entry fees went to the charity as well as the proceeds from the silent and live auctions held at the event. The winner is the boat with the heaviest 3 fish aggregate. You could weigh 3 fish each day and then take your 3 heaviest from both days to get your total weight. Congratulations to Day Sea 48’ Viking 1st place overall with the best 3 fish total weight of 109.6 lbs. Day Sea brought home over $21,000 in prize money. Andi De Young aboard the Day Sea caught the biggest wahoo of the tournament on day 1 a 48 lb fish. 2nd place went to Corks Crew a 40’ Seahunter bringing home over $8,900 in winnings. 3rd place was LLangus 48’ Riviera out of Freeport, Bahamas winning just over $4,200. Comfortably numb 42’ invincible also out of Freeport won the meat fish division with a 28.4 lb dolphin. The 1st year tournament was a big success and paid out over $40,000 in prize money. The 2nd annual OBB Wahoo Charity Cup will be held Nov 15th-17th 2018. Hope to see you there.